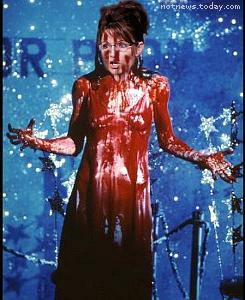 Sarah Palin news pic and still from the movie Carrie. Of course, she used her telepathetic powers to get the nomination. The poster asserts that the use of the source images is fair use under US law for purposes of political and satirical commentary.